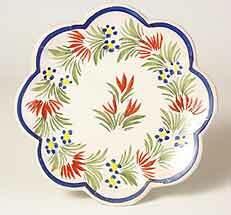 Small Quimper plate - 5" (127 mm) diameter. Quimper is a town in Brittany, North West France. The town has long been famous for producing faience - tin-glazed pottery. Faience is not peculiar to Quimper, indeed it is made in various places throughout Europe, but the Quimper faience is quite distinctive. Typical pieces have a white background with designs that nearly always include blue, and often green, yellow and orange. Traditional Breton figures often feature in the designs, the men with wide-brimmed round-crowned hats and the women with full skirts and aprons. Pottery has been made in Quimper for a very long time, but the faience that we recognize as Quimper has been produced since the late seventeenth century by three factories. The first was Grand Maison, and it preceded the other two by nearly a century. Its mark was HB, the H for Hubaudière, the name of the family that owned it from the early eighteenth century to the early twentieth century, and the B for Bousquet, the name of the founder. The second was Porquier, founded in the middle of the second half of the eighteenth century, followed a few years later by the third, Henriot. Identifying the factories by the marks can by confusing. Porquier used AB for a short time, but mostly PB. Henriot used HR, but the Grand Maison didn't like it, saying that it could easily be confused with HB. They took the matter to law, and Henriot had to stop using it, opting for HenRiot instead. Porquier folded in the very early years of the twentieth century, and in 1913 Henriot bought their molds and the right to use their marks. Subsequently the Porquier designs were made by Henriot and marked PB. Confused? Well, in 1968, due to a road scheme, the Henriot factory had to be demolished, and they moved into the same building as Grand Maison. Both companies were separate, sharing the same roof. Both companies ran into financial difficulties in the 1980s, they were bought out by their American importers and are now the same company. The wares are currently marked HB Henriot. Quimper new and old is widely collected, and has not, basically, changed much over the years. The connoisseur can spot differences between factories and ages instantly by the colour imparted by the glaze and subtle differences in the designs, which at first sight seem very similar.